Please vote. This is a critical election for the future of Vancouver. You can cast your vote at any of about 120 voting stations around the city from 8:00am to 8:00pm on Saturday, November 15. To vote on election day, bring your Voter Information Card to a voting station to make the voting process as quick and efficient as possible. If you are not on the voting list, you will need to show two pieces of identification and complete a voter registration form to be signed in front of an election official. This election, I voted for all the Vision candidates. This the first time in over 20 years I have not voted for any COPE or Green candidates. They lost me over their lack of support for the Broadway Subway and their campaigns that were based on attacks instead of workable solutions. I used to vote for one or two NPA people like Gordon Price and Peter Ladner. It is sad that they have abandoned forward thinking policies and instead focusing on forcing more speeding vehicles through communities with their poorly though out counterflow lanes idea. For their strong leadership on cycling, I highly endorse Rob Wynen, Brent Granby, Geoff Meggs and Heather Deal. See below for more information. For their (hopefully unsuccessful) attempts to using their opposition to the Kits Beach bike path for political gain, I strongly recommend NOT voting for Stuart Mackinnon, Melissa de Genova, John Coupar and Anita Romaniuk. As far as COPE goes, according to the polls, none of the candidates are even close to being elected. I don’t really know much about most of their candidates. It is sad that COPE chose not to work with Vision this time and the results will reflect that lack of cooperation. It will be a close election. The real choice is between Vision and the NPA. It is pretty clear that Vision is the better choice. As far as cycling goes, Vision has a good record of making improvements that have been in the plans for years although they have slowed down a bit last term implementing only one major cycling project, the completion of the Seaside Greenway in 3 years. The other big improvement was Burrard Cornwall, which is now could the best intersection in North America. 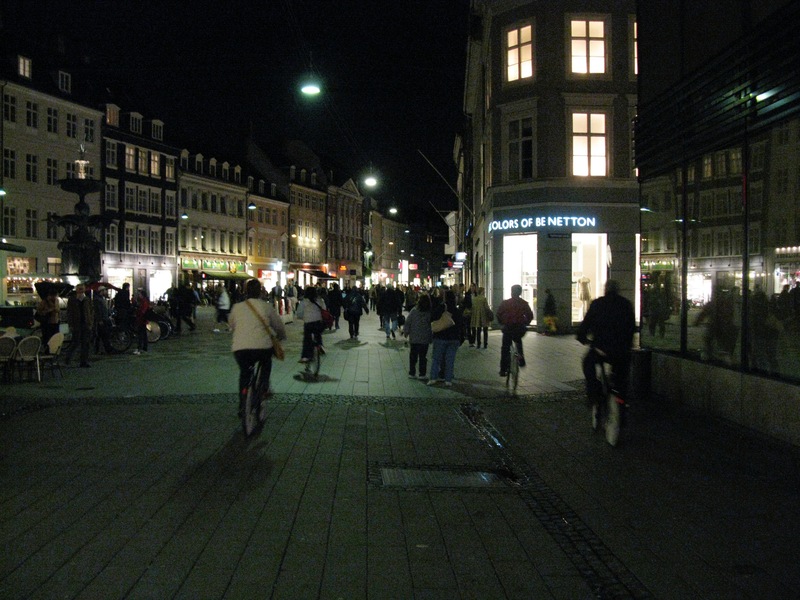 There were several other cycling projects in the new transportation plan that were supposed to be implement by now. Although, to be fair, these were big projects. However, to meet our transportation and GHG emissions reduction targets, the pace really needs to be picked up. Vision is willing to show leadership on issues like cycling, where, while there is angry opposition, the polling shows that the majority of people support these improvements. For council, the Greens have a good cycling policy including separated bike lanes on streets like Commercial and Main although I am concerned they might not get much done due to endless consultation. So, considering cycling only, they would be worth supporting. As far as the NPA goes, their cycling policy is weak and they are promising to “review” and possibly rip out Pt Grey. Sadly, COPE is promising a review as well. The NPA is also promising counterflow lanes which, even if they were practical, could add 30% more traffic to already busy city streets making our roads more dangerous for people walking, cycling and driving. However, I didn’t vote for the Greens or COPE mainly due to their opposition to the Broadway subway. Their opposition and statements simply tells me that they just don’t understand transit and good urban planning. The information is out there. It is surprising that they have either not read it or are ignoring it. The study including the numbers below is here. LaPointe’s point that he gets along better with the current Federal Government and thus is more likely to get money for transit is rather moot. By the time the funding for Broadway is really needed, there will likely be a new Federal Government that Vision is friendly with. Even if that is not the case, Prime Minister Harper is intent on wasted funds on reckless tax cuts that should be used for transit and other priorities leaving little for transit. The Liberals as well as the NDP have promised to reverse the irresponsible tax cuts and invest more in transit. Even if Harper did have the funds available, it is pretty clear that decisions of his government are mainly made on the basis of what will give them enough votes in key ridings that they need to win the election. Being a “friend” I suspect is of little value. As it extends the Millennium Line to Cambie making it easier for Millennium Line riders to transfer to the Canada Line downtown at Cambie, the Broadway is projected to reduce demand on the busiest section of the Expo Line by around 4,000 ppdph likely delaying the need to purchase more vehicles for the Expo Line, reducing pass-ups, delaying the need for costly upgrades and delaying the Expo Line from reaching capacity. 2041 Forecast Peak Load (passengers per hour per direction, pphpd) of Broadway Subway to UBC is 12,500. And that will only be 15 years after completion. They should really be doing 30 year projections. No way LRT will have enough capacity unless train frequency is increased to the point that it really disrupts north south bus and pedestrian traffic and or slows down service along Broadway. As already mentioned, I voted for and recommend all the Vision candidates. I’m convinced they will continue to make the improvements that we need in the city. I know Rob Wynen, Brent Granby and Geoff Meggs the best and strongly recommend them for their efforts to improve cycling as well as Heather Deal, who took a real lot of flack as the lead on Point Grey. Rob Wynen who is running for relocation to School Board has been a strong support of cycling for years. I meet him when we were both volunteering with BEST 15 years ago. He was a key member of the Friends of Burrard Bridge that successfully advocated for the successful Burrard Bridge separated bike lanes. Brent Granby has been supporting cycling improvements for years as well. He also was very active on Burrard Bridge. Geoff Meggs did a great job of working for cycling improvements especially last term. He was a key on the Dunsmuir and Hornby separated bike lanes talking with a lot of businesses and stakeholders helping to address concerns that they had. He is very hard working, really understands complicated issues and listens to and helps resolve people’s concerns. Exactly the type of person we need on city council. Hypocritically, both him and the other Green Party candidate (and the NPA) strongly support new pools in parks that will likely violate their no net loss of green space policy which was their excuse for opposing the bike path. A lot of concrete is required for pools which is another excuse that Stuart gives for opposing bike paths. While I don’t think pools should be a huge priority, I certainly would not oppose them. Some people like them. We need to be supportive of activities that others want to do in parks. Badly needed improvements for walking and cycling on the Granville and Cambie Bridges are along the projects including in the City of Vancouver in draft capital plan for 2015-2018. 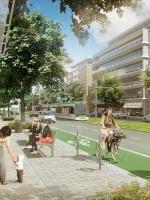 Also in the plan is a long overdue upgrade to the Burrard Pacific intersection. The total amount for new cycling, walking and transit totals $45 million over the four yours. As TransLink is responsible for the majority of transit funding, most of the $45 million will be devoted to cycling and walking. 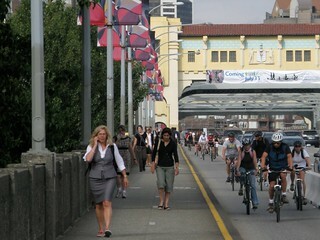 The Granville Bridge is currently the worse in the city for cycling. Not surprisingly, the cycling commuting levels are much lower in the area south of the bridge than in other areas of Vancouver the same distance from Downtown. Making the Bridge safer should dramatically increase the number of people cycling to work. Other cycling improvements listed are the completion of the Comox Helmcken Greenway and the upgrading of the Adanac, Ontario and 10th Avenue Bikeways so they are safe and comfortable for people of all ages and abilities. For walking, the plan features pedestrian safety and public realm improvements in the Downtown Eastside, Marpole, Mount Pleasant and West End community plans. Not mentioned are separated bike lanes on Commercial Drive which are on hold waiting for the completion of the Grandview Woodlands area plan. Also not included is the completion of the Portside Greenway nor separated bike lanes on Smithe/Nelson, a big network gap downtown. The final plan will go before voters for approval this November following public consultation over the next few weeks and approval by council in the fall. What actually gets implemented will depend on the next council so make sure you support candidates who support cycling. Never hurts to send a quick email to Mayor Gregor Robertson and Council mayorandcouncil@vancouver.ca supporting investment in cycling and walking.